This week we shall be checking out Carnotaurus sastrei! 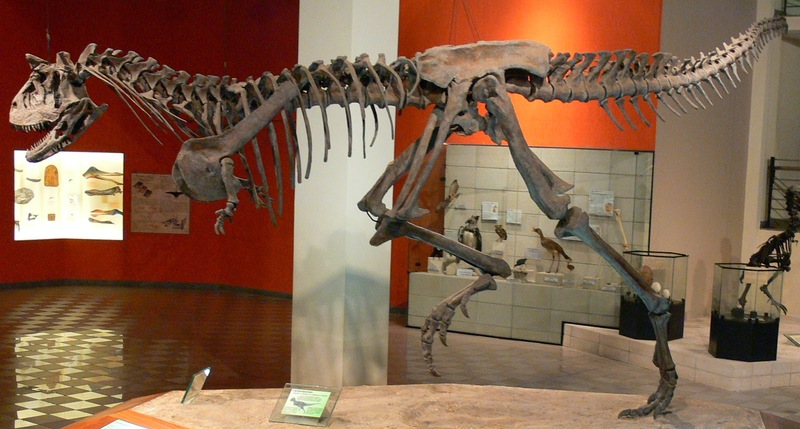 Carnotaurus was a meat-eating dinosaur that lived in what is now Argentina during the Late Cretaceous period, between 72 and 70 million years ago. The name, Carnotaurus, translates to "Meat-eating Bull" in reference to its diet and the fact that it had two large horns over its eyes. These horns are just one of the characteristics that make this incredible dinosaur one of the most stand-out, unique theropods known to science. Carnotaurus is considered a very late member of the group of theropods called ceratosaurs, of which was one of the largest members, estimated to have measured between twenty five and thirty feet long from snout to tail. (A good part of the tail was never discovered so we don't know exactly how long it was.) Ceratosaurus and Masiakasaurus were also ceratosaurs. Carnotaurus dueling life reconstruction by Christopher DiPiazza. Carnotaurus has done nothing but slowly and steadily gain popularity since its discovery in 1984. Like Spinosaurus and Velociraptor, Carnotaurus has gained its place as a well-known, mainstream predatory dinosaur next to the throne of Tyrannosaurus, thanks to the fact that it just looks so different. It was the main (terrifying) villain in the 2000 Disney movie, Dinosaur, and it was also a regular antagonist in the much more recent, cancelled television show, Terra Nova. ...the neck! And what a neck it was! Unlike the necks of many other large predatory theropods, which were relatively short, in order to support proportionally large heads, Carnotaurus had an extremely long, but thick neck. It's skull was also proportionally smaller compared to the rest of its body, which would have made using those horns that much easier as a shoving, swinging, or ramming weapon. Perhaps Carnotaurus engaged in these fights over territory, or males did over mating rights? We really don't know for sure. Even more frustrating is the fact that Carnotaurus is only known from one individual. Now, this one individual is beautifully complete, but it's still only one. This being said we have no clue if the horns of males and females differed in any way, which would help us get an idea of what they were for if we had that information. When it comes to Carnotaurus' jaw, there is some debate. 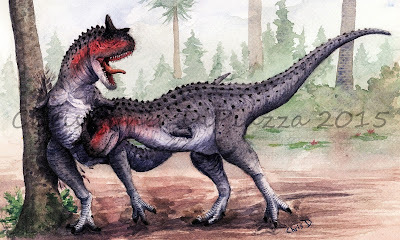 One group of paleontologists suggested that Carnotaurus would have been good at rapidly snapping its jaws, but didn't have a very powerful bite, at least not in the front of the snout. Snapping jaws is something seen in predators that specialize more in hunting smaller prey. The fact that Carnotaurus' jaws curved upwards, supports this, since it would be able to more easily grab smaller animals below it on the ground as they tried to run away. The opposing idea about Carnotaurus' biting strategy is that it was actually more adapted to taking down larger prey, like other dinosaurs, and did so by using its upper skull, which was very tall, like a hatchet, swinging its head, mouth open, into the flanks of a sauropod or hadrosaur, and cutting into it with the blade-like teeth. These paleontologists also found out that towards the back of Carnotaurus' jaws, it would have been able to bite down extremely hard compared to other dinosaurs, further supporting their claims that it was adapted for hunting large prey. As strange and specialized as it may look, perhaps Carnotaurus was really a generalist hunter, using both of these strategies to take advantage of small or large prey, depending on what was available to it? 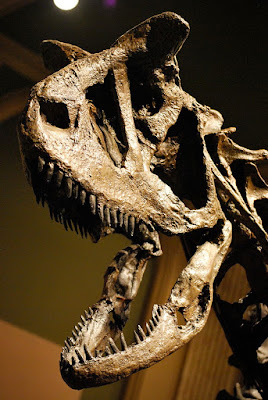 Close up of Carnotaurus' skull at the Dinosaur Discovery Museum in Wisconsin, USA. Carnotaurus had small arms. Really small arms. Smaller than Tyrannosaurus' arms. (WHAT?) At least the arms of tyrannosarids, although small, still could have served a purpose since we know they were strong, had some mobility to them, and possessed claws. Not the case with Carnotaurus. Its arms not only were even smaller than those of the tyrannosaurids, they lacked hooked claws on their four tiny digits, and were even angled with the palms facing outwards, further restricting any sort of function they may have served...if any at all. 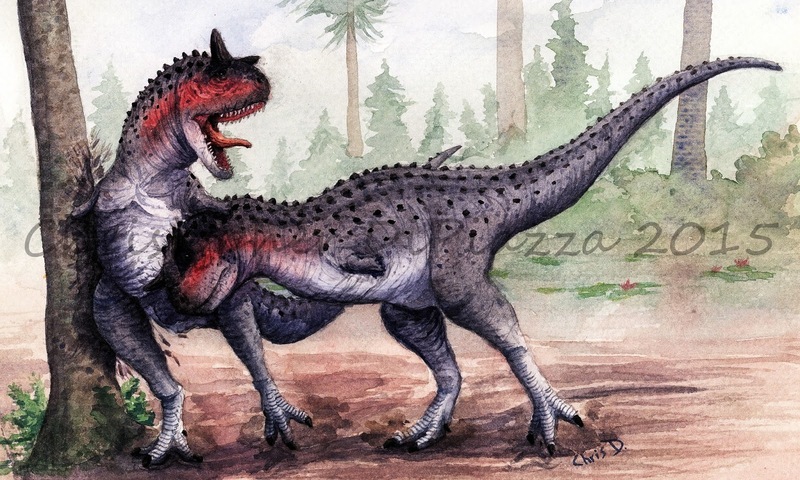 It is likely the arms of Carnotaurus were truly vestigial and had this dinosaur's lineage kept going for millions of years after its extinction, may have completely disappeared at some point! Not to worry, however, with a head like that, who needs arms, right? You know it's bad when T. rex, of all dinosaurs, is making fun of your short arms. Sadly, Carnotaurus' feet and part of the lower legs were never discovered, but the parts that we do know of are pretty slender. It may have been a fast runner in life from what can be told. (but again, only part of the legs are on the fossil record so we don't know for certain.) What is interesting is that the head and neck of this dinosaur were so robust, but the rest of the body, especially the legs, were actually quite gracile. Sadly, the environment of Carnotaurus is still mostly a mystery aside from plant life and some much smaller animals. We really don't have many other good fossils from other dinosaurs from that area so we still don't have a very good idea of what Carnotaurus would have been hunting, but a good hypothesis is that whatever it was, it might have been able to run fast too! Carnotaurus skin impression. note the small scales surrounding those large craters where the osteoderms were. Lastly, we know what the skin of Carnotaurus was like! And it was cool! Thanks to some beautifully preserved areas of rock around the skeleton that was dug up with imprints from the dinosaur's skin, we know that Carnotaurus' skin was scaly and pebbly, sort of like a crocodile's. between these scales, it also had bony protrusions that would have stuck out like little knobby plates down its back and sides. We call these structures osteoderms, and they are present in a lot of other kinds of dinosaurs and other reptiles like crocodilians, too. Bonaparte, José F.; Novas, Fernando E.; Coria, Rodolfo A. (1990). "Carnotaurus sastrei Bonaparte, the horned, lightly built carnosaur from the Middle Cretaceous of Patagonia" (PDF). Contributions in Science (Natural History Museum of Los Angeles County) 416. Candeiro, Carlos Roberto dos Anjos; Martinelli, Agustín Guillermo. "Abelisauroidea and carchardontosauridae (theropoda, dinosauria) in the cretaceous of south america. Paleogeographical and geocronological implications". Uberlândia (Sociedade de Naturaleza) 17 (33): 5–19. Czerkas, Stephen A.; Czerkas, Sylvia J. (1997). "The Integument and Life Restoration of Carnotaurus". In Wolberg, D. I.; Stump, E.; Rosenberg, G. D. Dinofest International. Academy of Natural Sciences, Philadelphia. pp. 155–158. Mazzetta, Gerardo V.; Fariña, Richard A.; Vizcaíno, Sergio F. (1998). "On the palaeobiology of the South American horned theropod Carnotaurus sastrei Bonaparte" (PDF). Gaia 15: 185–192. Mazzetta, Gerardo V.; Christiansen, Per; Fariña, Richard A. (2004). "Giants and Bizarres: Body size of some southern South American Cretaceous dinosaurs" (PDF). Historical Biology 16 (2): 71–83. Ruiz, Javier; Torices, Angélica; Serrano, Humberto; López, Valle (2011). "The hand structure of Carnotaurus sastrei (Theropoda, Abelisauridae): implications for hand diversity and evolution in abelisaurids". Palaeontology 54 (6): 1271–1277. Therrien, François; Henderson, Donald; Ruff, Christopher (2005). "Bite Me – Biomechanical Models of Theropod Mandibles and Implications for Feeding Behavior". In Carpenter, Kenneth. The carnivorous dinosaurs. Indiana University Press. pp. 179–198, 228. One of my fave dinos. Keep in mind, only the femora and the very proximal parts of the tibia were found for Carnotaurus, so we don't know how cursorial it really was. Some abelisaurids (like Majungasaurus) had very stumpy legs; others, like Aucasaurus and Xenotarsosaurus more standard proportions. But so far no abelisaurid has been found with tyrannosaurid-style leg proportions. I was going off of the information in Bonaparte's 1990 paper where they referred to the leg bones (like you said femur and tibia part) as being particularly slender. Maybe my wording in the post was too one-sided. I'll tweak it. Excellent work as always, could i request smilodon for a later beast of the week? I would like to see your impression on one of my favorite prehistoric animals. Sure. I'll add it to the list!